The Jack Nicklaus Signature Series is available at https://jacknicklaus.suncast.com and on Amazon. 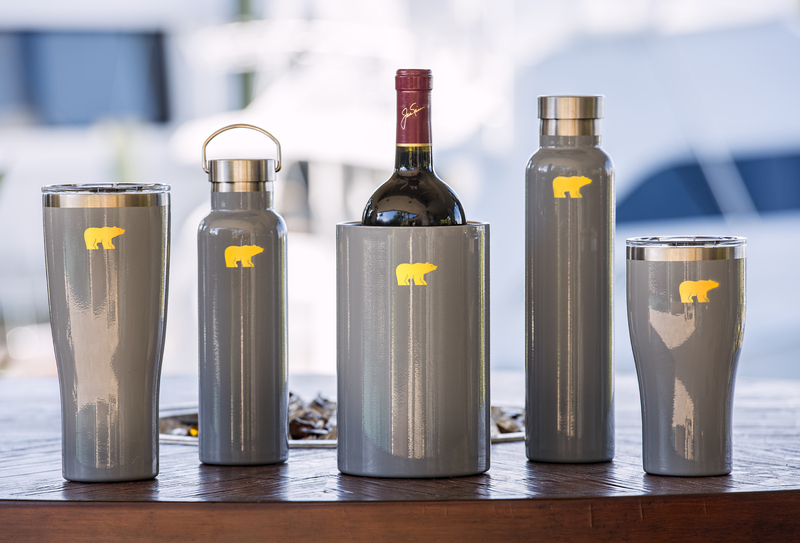 The Nicklaus Companies and Suncast Corporation jointly announced today that a line of drinkware inspired by the life and life style of Jack Nicklaus—the Golden Bear— is now available on https://jacknicklaus.suncast.com as well as on Amazon. The collection, which supports the Nicklaus Children’s Health Care Foundation, helps round out a larger Nicklaus-branded offering in the food and beverage space by the company founded by Nicklaus, the record 18-time major champion, businessman, and philanthropist. The line includes a selection of versatile cooler caddies, as well as tumblers, wine chillers and more, created for use on and off the golf course—from the backyard to the back nine. With eight SKUs, the Jack Nicklaus Signature Series created by Suncast Corporation complements Nicklaus-branded Golden Bear Lemonade by AriZona Beverages, Jack Nicklaus Wines by Terlato Wines, and water by AquaHydrate. Inspired by Nicklaus’ lifestyle, the Jack Nicklaus Signature Series was designed to exhibit the characteristics that a true champion possesses: grace, style, and performance under pressure. “Suncast Corporation is excited about its partnership with the Nicklaus Companies”, said Tom Tisbo, President and Chief Executive Officer of Suncast Corporation. “Not only do we feel our brand values align with that of the Nicklaus organization, but we also believe in giving back to our community. The Cooler Caddie is a soft sided cooler that is tall enough to hold wine bottles upright and sturdy enough to hold 22 pounds of ice. It was manufactured with practicality and efficiency in mind— the expandable, easy-to-open top is made for easy access, and its exterior pocket is great for storing essentials, such as keys, a cell phone, a bottle opener, and a wallet. The durable, leak-proof construction is made from heavy-duty 1680 denier nylon, includes a double-stitched nylon webbing handle, and features elevated Thermoplastic Rubber feet to provide sturdy above-ground footing. MSRP is $149.00 and includes a three-year manufacturer’s warranty. Two Tumblers in 20-ounce and 30-ounce sizes are popular offerings in the Jack Nicklaus Signature Series. Both sizes are made from BPA-free stainless steel. The material, plus double-wall vacuum insulation, allows the tumblers to keep beverages cold for a minimum of nine hours or hot for three hours. Both sizes fit in a standard-size cup holder, so on-the-go drinks can be enjoyed on the cart path or the road. Both tumblers come with an easy-sip lid that features one click closure to avoid spills and an opening to accommodate a straw. MSRP is $19.99 for the 20-ounce tumbler and $24.99 for the 30-ounce tumbler. The stainless steel, 20-ounce Jack Nicklaus Signature Series water bottle is also made of BPA-free materials. The double-wall vacuum insulation preserves beverage temperature, while the practical cap with ring lid is leak-proof and allows for clip attachment onto golf bags or belts. The design and materials allow the water bottle to keep beverages cold for a minimum of nine hours or hot for three hours. MSRP is $24.99. The game is meant to be fun—and so is life. Celebrate like a champion with the Jack Nicklaus Signature Series Wine Bottle. Also made from BPA-free stainless steel, the Wine Bottle is designed to hold a full bottle of wine (750 ML) and keep it cold for a minimum of nine hours. The complementing Wine Chiller holds one standard-size bottle of wine or spirits. Both products are perfect for enjoying several varietals of Jack Nicklaus Wines or Jack’s House Wines. The MSRP for the Wine Bottle is $29.99, while the Wine Chiller is $39.99. The Jack Nicklaus Signature Series’ design offers a unique option to consumers with the same high standard of quality as other top-of-the-line items on the market. Selected through a series of market research studies, the platinum gray color is the color of wisdom and knowledge, while being a neutral, timeless classic that is both sleek and professional. Each product also features the Golden Bear logo—one of the most enduring and iconic logos in all of sports. Jack Nicklaus became known as the “Golden Bear” shortly after turning professional in 1962 and launching a career considered the greatest in the game’s history. “We are delighted about our partnership with Suncast and appreciate Tom Tisbo’s faith in our company and the brand,” said Nicklaus Companies Co-Chairman Howard Milstein. “The Nicklaus brand has been a leader in the golf space for decades. Increasingly, our more recent product introductions, like Jack Nicklaus Golden Bear Grill restaurants and Jack Nicklaus Ice Cream, are being welcomed by consumers as lifestyle products, reflecting the best of American values just like Jack’s iconic career. Currently featured within the Jack Nicklaus/Golden Bear-branded portfolio of offerings are Jack Nicklaus Apparel, Jack Nicklaus Ice Cream, Jack Nicklaus Golf Balls, Jack Nicklaus Wine, Jack Nicklaus Golden Bear Grill, Jack Nicklaus Academies, and more. In addition to Suncast Corporation, the company’s marketing partners include AHEAD, AquaHydrate, AriZona Beverages, Delaware North, E-Z-GO , Perry Ellis International, Rolex, Schwan’s, Southwest Greens, SubZero and Wolf, Terlato Wines, and Toro. As a market leader in innovative home and commercial solutions for over 25 years, Suncast believes the perfect space is one that fits your needs. Suncast designs, develops, and manufactures stylish products with practical features for almost any situation. Constructed with durable materials and unique details, all Suncast products are designed to enhance your space for years to come. To learn more about the full line of Suncast products, visit suncast.com. The Nicklaus Companies is dedicated to promoting excellence in the game of golf, preserving its great traditions, and growing the game. For nearly 50 years, the mission of the Nicklaus Companies has been to enhance the golf experience, and to bring to the national and international consumer, golf-related businesses and services that mirror the high standards established in the career and life of record 18-time major champion and golf course designer Jack Nicklaus. In 2007, Jack Nicklaus partnered with Howard Milstein to help further the growth of the company and to realize the full potential of the brands and branded businesses. Howard Milstein is Chairman of New York Private Bank & Trust and is actively involved in the Nicklaus Companies serving as Co-Chairman along with Jack. Products and services include golf-course design, development of golf and real estate communities, and the marketing and licensing of golf products and services. Nicklaus-branded products have been marketed worldwide since 1962. For more information on the Nicklaus Companies, please visit nicklaus.com.